Is bedwetting disturbing your child's sleep? If your child's sleep is being disturbed by bedwetting there are some practical steps that you can take, however it's also worth remembering that bedwetting even in older children is common, and sometimes children may just not be "ready"
One mum told us "My daughter didn't come out of daytime nappies until she was 3 (literally as she started mornings at nursery) she is now 4 and half and still in nighttime nappies. Although we have had the very occasional dry night, more often than not her nappy is wet is night, however it's probably the only thing I have been relaxed about - as long as she is comfortable, happy and sleeping, I do not feel in a major rush"
We thought it might be useful to provide the Sheffield Children's Trust advice on bedwetting - see below. 1. Bedwetting is a common problem affecting 1 in 10 children at the age of 7 years. 2. One of the most important things to check is whether your child is drinking enough during the day. 6 – 8 drinks (around 200mls each) of clear fluids evenly spread through the day are important to make sure bladder capacity is sufficient to hold all the urine made overnight. training them to wee while asleep. bladder needs practice to grow to hold all the overnight wee. leaving it to the last minute and are often caught short while playing or in lessons. going to help at night. 6. Try to avoid fizzy, caffeine or blackcurrant drinks. again before going to sleep. 9. If your child is in pull-ups, do try them without for a week or so every 3 months – especially if they are becoming drier. 10. If your child is dry for around 50% of nights, reward charts for dry nights can be helpful for short spells. Do not continue if there are no signs of progress. Please bear in mind, this is general advice, and if you have any concerns about your child's physical or emotional welbeing you should always seek professional medical advice immediately. 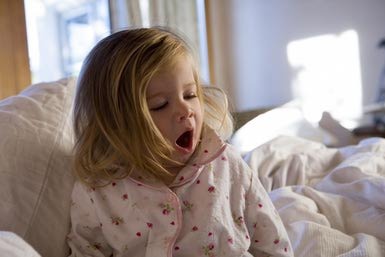 Older PostSleep, Cognition and Behavioral Problems in School Age Children.